I realize I haven’t posted in a couple days, sorry about that. I frankly had been quite busy running around doing things, and have this work in progress, so I hadn’t had the time to post. Anyway, recently, my friend Becca Bluebird came to visit, for the mermaid parade. I had so much fun hanging out with her and her husband. I made her a couple things. One thing I made her, was a necklace. That owl was from a charm bracelet that I received. I saved him, because he was too big to wear. I’ve been seeing necklaces like this around the city, so I thought I’d make one similar to what I’ve seen around the city. This weekend has been fun so far. Today, hubby and I are going to work on some art projects for my blog and our etsy shop, and maybe go food shopping. I realized that if I plan a menu, I save a lot more money than just impulsive purchasing throughout the supermarket. So I’m doing that. And I’m trying to go with more vegetarian foods. I really feel better when I don’t eat meat. I can’t cook it, because I get morning sickness. I can eat certain types, but I’ve been wanting to go back to my vegetarian ways for a while now, and it certainly is better for the environment. The nice thing about baking is that 90% of what you bake is sweet and therefore, vegetarian. I did make a nice vegetarian stir fry last night and oh my god. I loved it. I’ve been meaning to start my food blog about all my cooking adventures, and I will soon. I need a better camera, to photograph food. Today, I’m going to be working on more photo transfer jewelry, and some other pieces of jewelry for my etsy shop. That, and a project that I am VERY uber proud of. I wanted to wait, but I do not think I can. I’ll probably finish it today, and show you tomorrow. Anything else? I’ve been writing some new poems, so I want to venture to a thrift store and find some old books to alter, so I can make a collage book of my poems. So I completed my set of 20 ATCs for this Mega swap that I’m in! 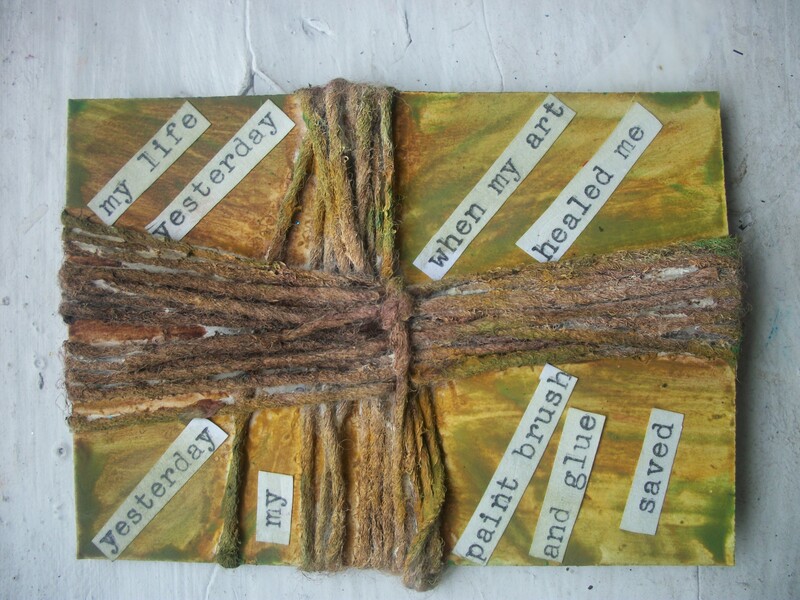 This is the final 5 ATCs which incorporate a poem I wrote some time ago. I’ll show you the pics of the ATCs, then I’ve posted the poem up, for you to read. The ATC version is slightly different, since I just felt inspired to do it that way. You like it? These are just cut up pieces of cardstock, with cotton yarn wrapped around it, and then gessoed. After that, I painted it with watercolors. The words came from my typewriter, and then I glued them and colored them with PAN pastels. So that’s that, really. That last one is talking about my brother, if you want to know. Since I do not have those cool little clear cases to send them in, I’ll be making my own. I got an ATC in the mail with a cool handmade envelope so I am using it as my template! Cool, right? The only thing is that I have to make 20 of them. Good grief. Tomorow will mark the end of my ATC week, so I hope you like what I have in store for tomorrow. now she sleeps on my shoulder and shakes her almost four year old hips. The point of the poem is that we look around at the past so much sometimes, that we forget to look at the beauty of the present day. Yesterday may have brought pain but today is where we are at now. I hope you like my art and my poem. So recently I finished working on a set of 10 gift tags. I notoriously collect vintage dictionaries for use in collage work and such, and decided to make a cute set of tags with some of the paper I had. I used different ink shades, and some pretty yarn that I received in a swap. You like them? I’ve listed them for sale in my etsy shop, if you’re interested. You get the whole set of 10. On another note, I’m really excited to be taking a PR training course online this year. Recently my husband and I have been thinking about some new ideas we’ve got for my online shop and my etsy shop, and just want to rethink things. This summer (starting in July) I’m going to take a much needed break from teaching too often, to just focus on my blog, and the product ideas my hubby and I have in mind. So that being said, a woman that I am proud to say is my personal friend (The Crafty Chica), is teaching a PR course online. I’m so excited to take this. You know, the truth is I am not good at thinking about my creativity on a business level. I just want to make stuff, I don’t want to think about how to go about selling it. You know? But I’m really excited to take this course, because my hopes is that it will prompt me to do things a little differently. Plus, I love that The Crafty Chica really is a person who is qualified to teach a course like this because I mean, well look at all she’s accomplished. You know? Anyway, the link to the course info is HERE. So that’s that, really. Today there is supposed to be a solar eclipse and a New Moon. If you’re superstitious at all, the new moon is when you’re supposed to attract things to yourself: new ideas, new projects, etc. Here’s an idea: why not make a wish box? You can collage it with all the things that represent what you want in the coming year or so. I think I’ll make one today. I have an empty shadow box, so I might make a shadow box/shrine box thingie for my wishes and dreams and such. So today, I finished up a quick project: a set of pretty little tags. The Flowers are handmade, of course. I glittered the edges. Now, normally I ink up the edges with a bit of ink, but I was feeling in a rather messy kind of mood, and just smudged glue on the sides with my hands. The glitter is by Martha Stewart, I believe. This set of four tags is for sale in my etsy shop. What else? It’s really hot here in New York City today. Super hot. I happen to be an early riser, and this morning at around 6:30, it was raining like crazy! I sent my husband out to buy me coffee and bread and the poor guy came back soaked to the bone! Can you believe that? And now of course, it is super duper hot. I know I told you I’d post pics about my concert, but truthfully concert pics look bad. They never come out right unless you’ve got some fancy camera or something. I have a friend who is really into couponing. Because of this, it has peaked my interest. After christmas, due to coupons and a clearance section, I was able to get these little candle holders for about ten cents. Yes, really. On another note, I also collect pretty napkins, mostly for collage work and candles and things. I went to an event where they had these pretty elephant napkins, I just had to make like a hillbilly and put some in my purse. Originally, I had seen something like this on pinterest, but it was just a review for a book. These are quite easy to make. Just get yourself a sponge brush, Mod Podge, and some candle holder thingies. Brush on the Mod Podge, and CAREFULLY put your napkin on, and smooth it over with your hand. Then carefully brush some more mod podge over it, and let it dry. Oh, and here’s a new item of interest: I’ve got a newsletter now. If you want to keep up with my goings on, get exclusive content, and be “in the know” I highly suggest you subscribe to my newsletter. What else? Oh, I’ll be posting a fun announcement today. Stay tuned. Or if you’re on my facebook page, as a fan or something, you’ll see the update on my status. Be excited. I certainly am!